However, the board voted to change the final two items on the list of alternates it approved in August 2013 in the event cost savings would permit their inclusion. 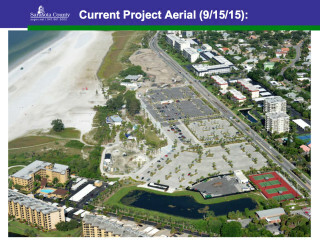 County Project Manager Brad Gaubatz added, “It still amazes me, that a year after construction began, Siesta Public Beach won a No. 1 ranking through TripAdvisor. 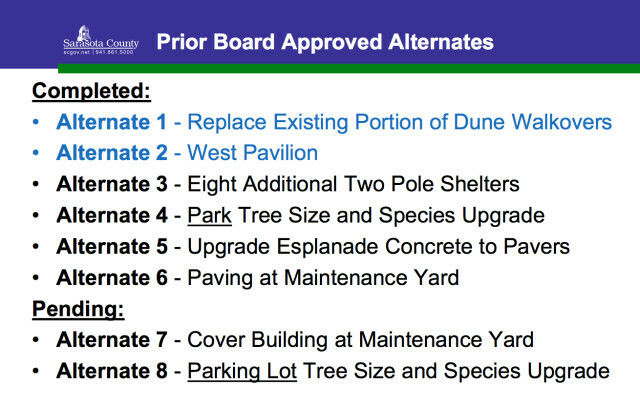 A staff memo says of Alternate 8, “Since the majority of the parking lots have been completed, accepting this alternate at this time would involve large scale alteration of newly installed landscaping and its associated irrigation. For this reason it is not cost-effective or practical to implement.” Therefore, the memo continues, staff recommends removing Alternate 8 from the list. 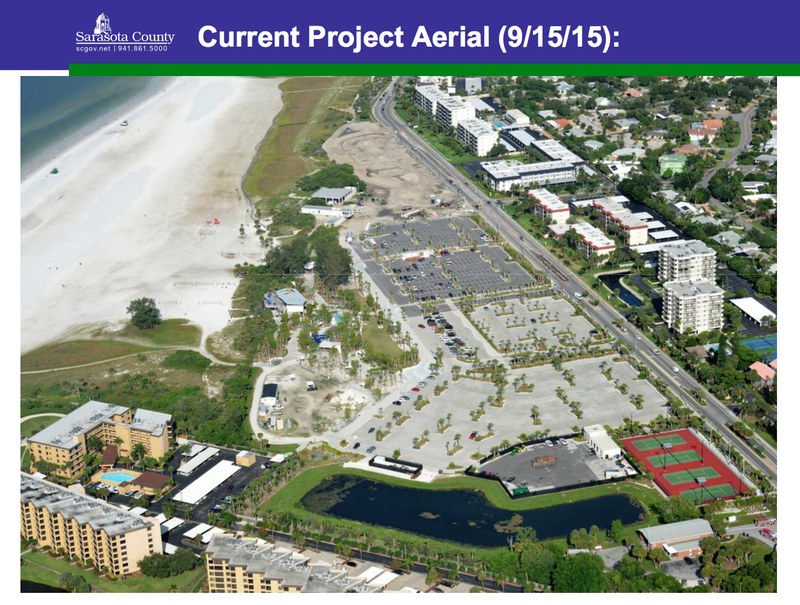 In regard to Alternate 7, the memo notes the proposed 40-foot by 40-foot open metal shed, which is expected to cost $90,000, would be designed to cover equipment that is stored outside, including a beach-cleaning tractor and the surf rake the tractor pulls. Staff recommended making that Alternate 8, the memo adds. The new Alternate 7, staff suggests in the memo, would be the replacement of eight wooden two-pole shelters with concrete structures like those already installed in other areas of the park. However, if the board preferred, the staff memo points out, the $400,000 could be used to help pay down county debt incurred on the project. Commissioner Christine Robinson told Gaubatz she recalled another county staff member — Spencer Anderson, who used to be responsible for certain initiatives involving Siesta Public Beach — emphasizing to the board members the need for the maintenance yard building. She added that Anderson told them keeping the equipment outside exacerbated the “wear and tear” the tractor and rake normally incurred. Gaubatz concurred that having a cover over the equipment would enable them to function well for a longer period. Nonetheless, Brown told Robinson, “I don’t know how much of a great difference it would make,” because the equipment still would experience some exposure to the elements because the shelter would be open. In response to another question from Robinson, Gaubatz said the values of the tractor and rake are about $88,000 and $50,000, respectively. Robinson thanked Brown for her comments. Then Robinson added that she realized the new concrete picnic shelters would be a benefit for the public. She made a motion to approve the adjustment to the alternates as proposed by staff.